Last Sunday, after a pretty stressful weekend of marking, and in preparation of an even more stressful week ahead of me, I curled up on my sofa with a cup of tea and found a little afternoon film treat; Little Women, the story of four sisters (Meg, Jo, Beth and Amy) growing up during the American Civil War. With their father away fighting the household and the ‘little women’ have to come to terms with the hardships of war, romance and growing up. 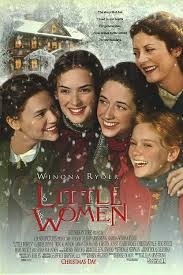 This adaptation of Little Women was filmed in 1994 and stars Susan Sarandon as ‘Marmee’, Winona Ryder as the fiercely independent Jo and Christian Bale as Laurie, the young man living with his Grandfather across the street, as well as a whole host of other well known names. This isn’t going to be a particularly long post, as my workload is still calling, but I wanted to share some of the things I love about this film. Firstly, when I realised this film was on last weekend I was on the phone to my Aunty, well Mum’s Aunty, and we both mentioned that we would be watching Little Women that afternoon. I only share this because it was at my Aunty’s that I first saw this film many moons ago, when we still had VHS, so it conjures up memories of drinking endless cups of tea, chilling out in front of the fire and becoming engrossed in the beauty of the film. Despite the fact I probably didn’t understand some of what was going on context wise when I first watched it. I really enjoy the relationship between the sisters, particularly that of Jo and Amy, which undergoes so many changes as both characters are independent and strong minded, Jo more so as Amy matures and seems to grow out of it with age. I can relate to the friction so well, having a sister myself who I frequently argued with when we were children, but it certainly gets better as we have both grown up. The film clearly left such a strong impression on my mind as when I read the novel a few years later I was shocked to find that certain key events are not in the novel. Was I confused? Of course, I thought I had bought the wrong copy, or a shortened version. Of course I did a bit of research and discovered I needed the follow on novel Good Wives, so I rushed out and bought it and all became clear. It really is an uplifting and heart warming film, and if you haven’t seen it before I certainly recommend it as the perfect chilled out Sunday film, in fact I could just curl up with tea and crumpets and watch it all over again this afternoon. After what has felt like weeks of reading fiction aimed at Young Adults, mainly in preparation for my Carnegie Medal Enrichment at school, I was in dire need of a break and something slightly more grown up. 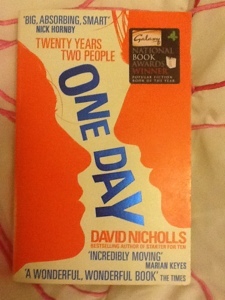 Due to the craziness of school at the moment, I chose a reread, David Nicholls’ One Day. One Day follows the lives of Dexter and Emma from their first proper meeting in July 1988 when they are both on the cusp of leaving university in Edinburgh until the year 2007. Every year on the anniversary of the first true meeting, July 15th (St. Swithin’s Day), Nicholls dives into their lives and we discover how Dexter and Emma are coping as they move through their twenties, thirties and into middle age. We experience the highs and lows of their love life’s and careers; from affairs, marriages, deaths and births, we witness Dexter and Emma at their best and at their worst. Although their paths venture off in different directions; one to exotic lands and the life as a TV presenter, the other a dire job in a Mexican restaurant, teaching and eventually an author, the pair are inextricably linked through the good times and the bad. The structure of One Day is truly unique, returning to the same pair of characters year in, year out on the same day. We do get to read about what has happened in their lives during the course of the previous year as it would be unrealistic for all major, significant events to take place on July 15th, not to mention a tad spooky! This is a fantastic way to learn about, and grow to love (and loathe) the characters; events happen in a believably time scale, making them more realistic, and for me personally, more engaging. I can truly believe that people change careers, marry, divorce, move house etc over the course of nineteen years, as opposed to one or two. I also enjoy the sense on continuity with the structure; you know we are going to meet Dexter and Emma on July 15th each year, but you have no idea what direction their lives would have taken. ‘You’re gorgeous, you old hag, and if I could give you just one gift ever for the rest of your life it would be this. Confidence. It would be the gift of confidence. Either that or a scented candle. I love how Nicholls writes a beautiful and heart warming letter, yet it is still interspersed with humour. I also love the sheer irony of the fact Dexter expresses all these feelings and yet carelessly loses the letter, leaving it inside a copy of Howards End in a bar in India. Imagine how different their lives could have been if only he had posted it? And yet in the face of all this will they, won’t they romance is quite possibly one of the most tragic and shocking deaths in modern literature (a bold statement I know, but bear with me). Finally, after years of going back and forth, of talking and not talking, of lusting after one another and admitting defeat, Dexter and Emma get together. Yay! I’m reading it and I am over joyed, yes love does triumph eventually and everyone will live happily ever after. Sadly life isn’t as perfect as a fairy tale. Sixteen years after we first meet them, just as they are settling down and hoping for a family, Emma is killed in a road accident. Did anyone see it coming? No! Did anyone really believe what they were reading? Probably not! I know everyone I have spoken to who has read it was shocked, had to go back and read it again because they couldn’t believe it. This is why I love One Day so much, just when you think the perfect ending is going to happen, Nicholls rips it away from you. It truly shocks you; even the second time round and I knew it was coming I could feel my eyes welling up in anticipation and sobbed my heart out. How could he be so cruel? This is the beauty of it, literature is supposed to take you on an emotional roller coaster, sometimes you get the ending you hope for and sometimes you are left shocked to the core, but it makes you feel something, and that, for me, is the magic of reading. And the best part? In a similar fashion to Life of Pi, One Day is such a beautifully tragic novel that I have no desire to watch the film at all; the book is perfection and you can’t argue with that. Shorty is a fifteen year old gangster, rolling with older boys and policing ‘The Site’, a run down, fenced in, poverty stricken area of his city. The boys are playing at being gangsters, listening to rap music and daydreaming about becoming famous rappers, carrying guns and promoting violence. But they can do this because no one seems to care what poor, disillusioned black children are doing in the slums in Haiti. Or at least no one seems to really care until the earthquake hits. Suddenly, Shorty’s world is plunged into darkness and he is imprisoned in a tomb of rubble, rotting corpses and rats. It is here that Shorty begins to recount his story and the events that led him to this darkness. We learn about his missing twin sister, the fate of his father and how he coped with life in ‘The Site’. There is a strong culture of voodoo and black magic in ‘The Site’ with many believing the bones of the dead, pwn stones and calling the spirits of the dead will save them from a gruesome death. This belief opens the door for a parallel narrative that as many strong connections to Shorty’s story. The parallel narrative recounts the life of Touissant, a black slave in Haiti in the 1700s. The slaves are rebelling against their white French plantation owners and beginning to gain their rights and freedoms. Both narratives have strong links to black magic culture and the both stories move towards a point where the narratives become one. 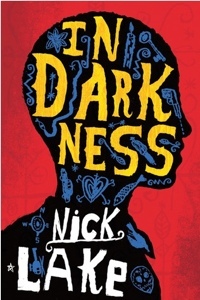 In Darkness is the third book I have read for the Carnegie Medal Award and my school book club (although the first meeting isn’t until Friday, I just wanted a head start). Personally, I did not like this novel at all. I found it confusing to follow to begin with as it was flicking between many time periods and talking about voodoo and magic and things I know little about. Even when I figured out what was happening I still didn’t become enthralled in the book. In fact last night when I knew I wanted to finish it I was constantly watching my % counter on the Kindle waiting for the end. 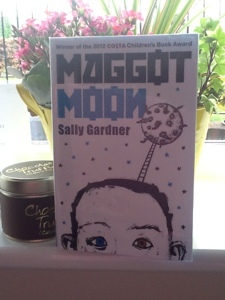 Yes it is an interesting choice of subject and I can almost see why it was shortlisted, but for me it was not an engaging story and I found it really difficult to relate to the characters and the narrative. I know very little about the Haitian earthquake and I think this will be a similar situation with the students in the book club, and as far as my recollection of school history goes, Haiti isn’t a place that is mentioned or studied in relation to the slave trade. I appreciate that it is important to give voices to those who haven’t had an opportunity to tell their story, and I applaud Lake for doing that, but for me this doesn’t achieve that in the most memorable or exciting way. Sadly not a winner in my eyes…which probably means the students will love it as that is sod’s law. Now I freely admit that I am rubbish at watching films; I don’t have the attention span for them. I always feel the need to be doing something else at the same time, and as proof of this I am currently watching Jane Eyre and collecting my thought and feelings on it together at the same time. Arguably this could detract from the actual film but I need to be doing something as well. Jane Eyre is a novel by Charlotte Bronte focusing on the life of Jane, from a young girl in her aunt’s house to a governess to a married woman. Jane, an orphan, endures a hard and loveless childhood, tortured by her older cousins and disregarded by her heartless aunt. Jane is then sent away to Lowood School, where conditions are appalling and many girls do not survive various outbreaks such as tuberculosis. Jane is lucky. She is a survivor. After years as a pupil and a teacher she becomes a governess to a young French ward at the imposing Thornfield Hall. It is here that she meets Mr. Rochester and embarks on a journey of self discovery where she is pushed to her limits upon discovering more about Rochester’s life and past. Jane Eyre is played by Mia Wasikowska. I quite liked Wasikowska’s portrayal of Jane; she made me want to read the novel again, and as I have already admitted I am not a huge Bronte fan, so I view this as quite an accomplishment. She was exactly what I expected from Jane, plain, humble and slightly self righteous, but I guess that is because we don’t have as strict a moral code in modern day society. I was moved when she told Rochester that she couldn’t stay after finding out about Bertha and this was my favourite scene from the film. 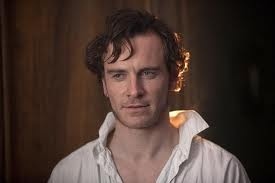 Mr Rochester is played by Michael Fassbender and for me he stole the show. We all love a good romantic hero, possibly one of the main reasons so many of us return to the classics time and time again, but Rochester has never been top of my list. It’s amazing how much a film can alter your perception. I remember watching an older film version when I studied Jane Eyre for A Level and not being wholly convinced with the character portrayals, none of which were memorable. However, I sort of fell a little bit in love with Rochester in this version. He is quite ruggedly handsome and I like how he teases Jane. But perhaps the quality that made him most desirable was his smoking. Now I realise this is odd, and I am not a smoker myself, nor do I like being around smokers, but I do love watching people smoke, very strange I know. I have always associated smoking with evil characters (blame Disney) and I like how it highlights Rochester’s darker side. As always with good periods dramas, it is the settings that I love the most. 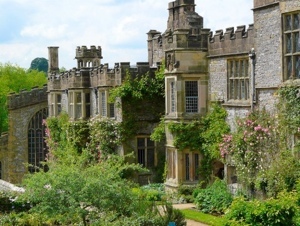 Thornfield Hall, the house of Mr Rochester, is essentially played (if I can call it that, but I guess the houses are still characters) by Haddon Hall in Derbyshire. It is beautiful, and so are the surrounding grounds. 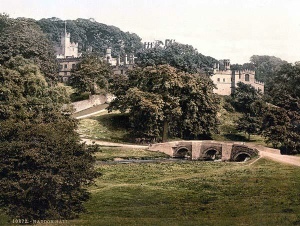 One of the things about the novel that has stuck in mind all these years has been the imposing nature of Thornfield and how this reflects the secrets it hides within its walls…attics! (oh Rochester just proposed) Films like this remind how much I love the British countryside and all the treasures it hides; I am looking forward to exploring more of them in the coming years. Overall, I enjoyed this adaptation of Jane Eyre and would highly recommend it, even if, like me, you are not a huge Bronte fan. 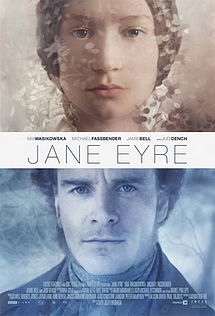 I felt the narrative was cleverly portrayed and I particularly liked the flashback element; unlike the novel the film starts with Jane’s escape from Thornfield and her childhood and time with Rochester is interspersed with her time with the Rivers family. I felt this was an effective way of engaging the audience, as someone who knows the novel well I loved this slightly different take on the narrative. This was the second film I have watched for the Period Drama Challenge and if my film going habits are anything to go by I’ll post another one in 3 months! And so March draws to a close and Spring is supposed to be blossoming in the UK. Whilst most of the country seems to be battling a late flurry of snow storms, my corner of Wiltshire seems to have escaped unscathed; a blessing because no one wants a snow day in the Easter holidays. 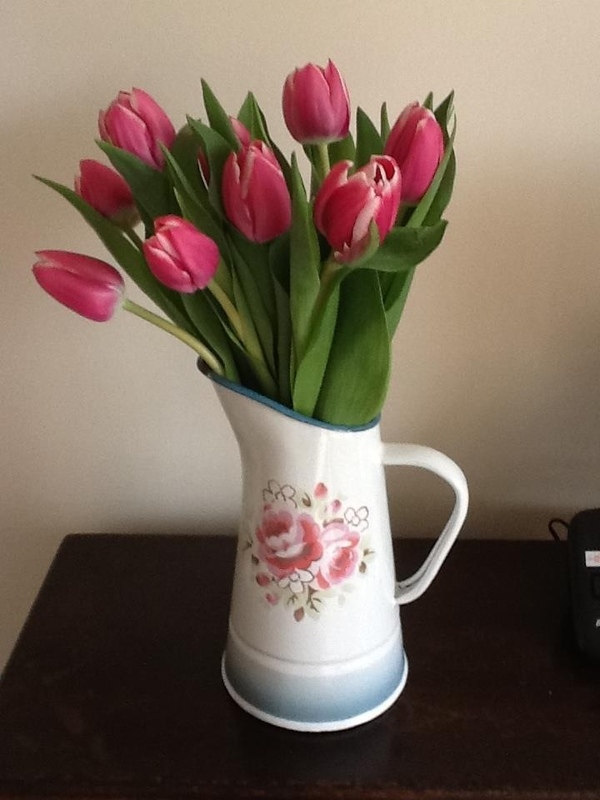 So although the weather is beginning to resemble Spring, the temperature certainly isn’t, luckily someone bought me some beautiful tulips to keep me hopeful that soon the sun will be out in all it’s glory. Back to the reading and I am pleased to see I actually read quite a bit this month, including my selected book for The Classics Club Spin. 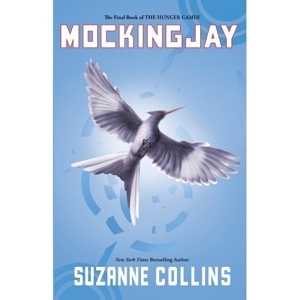 The majority of my reading this month has centred on fiction for young adults, mainly because I am running an enrichment at school based on the Carnegie Medal Awards; I am also deep in The Hunger Games madness, so much so I am reading the final installment at the moment. I think this has helped boost up the amount of books I read this month, especially as I spent a large portion of the month focusing on Villette, which means one more ticked off my Classics Club list. March also saw two key blogging events: my one year anniversary for both my blog as a whole and for my Classics Club list. I cannot quite believe I have been blogging for a whole year and kept it up, and most importantly that I am still enjoying this. So as a Happy Birthday to me (and a well done for dedicating a whole weekend to marking and no TV/Facebook) I bought myself a little present. I am a tiny bit addicted to these Connells Guides since reading about them on a different blog and purchasing the one for To Kill A Mockingbird, so guides to Great Expectations and Tess of the D’Ubervilles are welcome additions and will be great companions to my rereads of these novels. 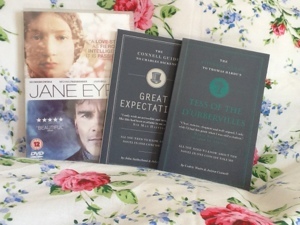 I also bought the latest film version of Jane Eyre, well at £3 I could hardly resist, but in true fashion I doubt I will get round to watching it for a good few months…reading is much higher on my list of priorities.